After the Thor: Ragnarok trailer dropped, one of my friends asked “have they given any reason for the 80s style graphics and stuff, other than that kinda stuff worked with the Guardians movies?“ followed with a somewhat joking “I’m hoping Infinity War manages to avoid ending up with ’80s home video graphics and a booming Spandau Ballet soundtrack “ and in thinking about that, I came up with two very different answers. First and most cynically it’s clear that nostalgia, specifically for the ’80s, is a powerful force in entertainment at the moment, because the demographic of folk who were kids in the 1980s currently have a lot of purchasing power and are also the right age to be doing things like directing and making design decisions regarding movies. It has to be said that I’m not really a fan of the current trend to license loads of popular (sometimes ‘period’) songs and play them to death in movies and use them as key beats in the trailers. It worked for the Guardians of the Galaxy movies because there was a novelty in that to start with, plus it made sense given the film’s plot. Crafting a soundtrack is an art form in its own right and I’d like to see more/better use of bespoke themes rather than seeing the big studios pay through the nose for a name song because it has some lyrics that might kinda fit the movie. All that said, I understand the promotional power of a familiar song, so I understand why it’s being done, even if I don’t much like it. However, as much as the marketing power of nostalgia is undeniable and you could draw a line under the question there, I prefer a more… artistic answer. Therefore, I contend that the MCU has very distinct aesthetics for its varying threads and they are being pulled together for the ensemble extravaganza that is Infinity War and the 80s vibe of Guardians of the Galaxy and Thor: Ragnarok is consistent with that. 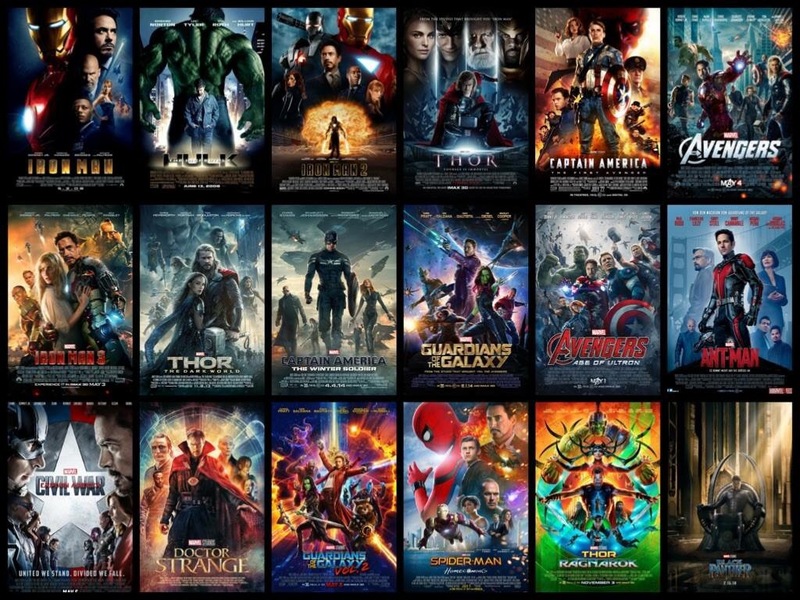 You can group the MCU films into three broad categories and while some movies will sit across the bounds of these groups, they will tend to favour one. – Terrestrial titles are those set on Earth and dealing mostly with Earth-based threats, enemies that are human, or human-made, fire bullets etc. Thus far, this is by far the biggest category encompassing both Avengers movies*, the Iron Man and Captain America series, the Incredible Hulk (yes, that technically counts as an MCU movie,) Ant-Man and Spider-Man: Homecoming with Black Panther yet to come. * Yes, the threat in Avengers Assemble was mostly from outer space, but all the action takes place on Earth and the Chitauri pretty much only show up right at the end. These categories have some give, seeing as it’s shared universe. These films tend to have realistic (for a given value of realistic, these are comic book movies after all) aesthetics, with villains who are terrorists or criminals, perhaps augmented by some sort of suit, robotics or next-gen tech that doesn’t seem too implausible and are generally shot in such a way that it’s very much a sense of wild stuff happening in our real world. – Cosmic titles are those set off-world, with alien threats, spaceships and so on and as such include the Thor** movies and the Guardians of the Galaxy series. It’s likely that the upcoming Captain Marvel movie will straddle both Cosmic and Terrestrial categories. ** For all that much of Thor was set on earth, but the real drama happens on Asgard at both ends of the movie. These films have a more extravagant aesthetic with a much more vibrant colour palette than the Terrestrial movies, both in terms of character and set design but also in the way the movies are shot with the possibilities of space battles, fantastical realms and so on used to create a sense of escapism which is distinct from the Terrestrial films. – Finally, Magical titles are those which deal with the supernatural and threats from other dimensions. This is a pretty thin category at the moment, only really encompassing Doctor Strange, although the principle of magic as a thing distinct from ‘superior technology which appears magic to less developed beings’ was already established by Loki and Frigg in the Thor movies. Based purely on Doctor Strange, these films peel back our reality in a way that seems similar to, yet distinct from the colourful nature of the Cosmic films with the warping of perception more the focus than the change in location. With these broad categories in mind, it’s worth noting that each character inside the MCU has its own biases and despite all being Terrestrial movies, there is a distinct tone to an Iron Man movie compared to a Captain America movie or compared to Ant-Man. Even though the Captain America sequels The Winter Soldier and Civil War were partially ensemble pieces featuring some of his fellow Avengers, there was still a distinct tone and theme to those movies compared to say, Avengers Assemble and a focus on Cap as THE lead character rather than merely one of the main squad. I’ll come back to the idea of the Avengers movies being distinct in a bit. The character arc which seems to tie all the categories together best is Thor, who starts in a Cosmic setting, comes to Earth for his Character Building Moment and then returns to the cosmos, although we are reminded that he keeps Earth under special watch. His mother and (adopted) brother are users of sorcery and he meets with Doctor Strange, thereby connecting him to the magical category. Finally, Thor’s most recent outing sees him team up with a usually Terrestrial character (Hulk) in a Cosmic setting and the leaked Infinity War trailer starts with him bumping into the Guardians of the Galaxy. So, in the sense that Thor: Ragnarok is a Cosmic title, it’s only right that it has a similarly vibrant aesthetic, although it is notably brighter than the previous Thor movies? Why is that? The Collector inhabited a particularly extravagant part of the first Guardians of the Galaxy film and it’s only reasonable to expect that his more extroverted associate would occupy a world just as bright. The aesthetic choice also brings Thor visually closer to the Guardians of the Galaxy, who he seems destined to hook up with next summer. First of all, this is an Avengers movie and they have an aesthetic of their own, which is informed by yet remains distinct from the threads carried in by its ensemble cast. They tend to be more serious in terms of the stakes which are being fought over but generally less about character development. They tend to have their share of jokes but not be as given over to comedy as some of the other movies. Given that the Russo Brothers are directing, I’d expect a dash of cosmic scale and vibrancy added onto the relative gritty realism they brought to The Winter Soldier and Civil War and the leaked trailer and sneak peek we’ve had of Thanos & the Black Order seems to back that suspicion up. Marvel movies are often spoken of as if they have a singular formula but while they undoubtedly all seek to hit a narrow target where action and character, import and comedy come together in the most marketable combination, there are undoubtedly difference in tone and aesthetic in terms of the themes, characterisation and audiovisual presentation between the different categories of setting and the different characters and series within the shared universe. Marvel is pulling these disparate threads of the MCU together for Infinity War and I’d strongly suspect that the tone of that film will be closest to the preceding Avengers movies, with a tendency towards Captain America style seriousness rather than Iron Man sarcasm and an extra dash of Cosmic colour given the extra-planetary nature of the threat.